Description: PRR 3422 is on the point of SESA at CP-SK in Selkirk, NY 4/21/1999. The split is a little more than a month away and locomotives to be conveyed to NS are being patched with their NS numbers and PRR reorting marks. 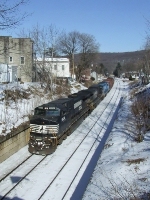 Description: NS train 24N eastbound thru Centralia. Title: Ex-Conrail Leads WB 21M @ 0857 hrs. Description: Former Conrail SD40-2 #6516 on the point of WB intermodal train. Title: WB 21E Has Leased Relco Engine In Consist @ 0920hrs. Description: Two more GP60s, a Relco B39-8E and ex-CR #6516 in the power mix. Description: Westbound on track one with an ex-Con leading. Description: Two SD40-2s still in Conrail Paint lead H65 into Washington today. Description: Push-Pull Local at BR&W Interchange, 1434 hours. Description: A pair of 9s and an ex-CR SD40-2 bring 38G in onto the yard track. Description: a going away shot of the ALCA. Description: NS MoW train at Clinton Street yard in Ithaca, NY on August 6 2007.